At Omni Butcher Blocks we believe in crafting only the best cutting boards on the market, never compromising in materials or craftsmanship, believing that a great cutting board can be a source of inspiration for the cook. Chefs prefer End Grain Butcher Blocks because they show fewer knife marks and will keep your knives sharper by reducing wear that can lead to dull blades. Each one of our End Grain Butcher Blocks are truly unique pieces and designed specially for the cook who is always searching for the best! The perfect carving board just in time for the holidays! Present your holiday meal on this beautifully crafted, Maple carving board for generations to come! Our unique and extra wide channels were specifically designed for carving and serving. The reverse side of the board is perfectly flat for everyday use. Approximate measurements are 22" x 16" x 1.5. $165.00 plus applicable taxes and shipping. Beautify your holiday table with this gorgeous Black Walnut Serving Board. Hard Sugar Maple accent strips provide a stunning contrast to the rich, chocolate hues of the Walnut. Approximate size 20" x 14" x 1.5" with cut out handles for easy lifting. $165.00 plus applicable taxes and shipping. This beautiful carving board is crafted out of hand-selected, Hard Sugar Maple. The extra large juice perimeter helps to catch juices from all your meats. This board is truly one of a kind! Approximate measurements are 22" x 16" x1 1/2". $145.00 plus applicable taxes and shipping. An exceptional cutting board built for everyday use. Hard Sugar Maple with Black Walnut Inlay. The durable Edge Grain construction keeps your blades sharp and the wear of your board to a minimum. Approximate measurements are 18" X 12" X 1.5". $89.00 plus applicable taxes and shipping. 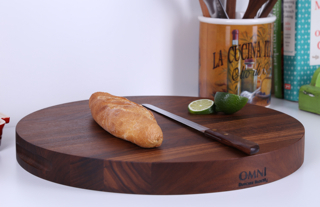 This elegant, round cutting board is made of American Black Walnut and doubles as an elegant serving platter. It comes with cut-out handles on the sides for easy lifting. Approximate measurements are 17" diameter x 1.5" $129.00 plus applicable taxes and shipping. This is a beautiful and practical board made of American Black Walnut. This attractive board doubles as a serving platter for bread, cheese and cured meats. This board is truly one of a kind! Approximate measurements are 19" X 12" X 1.5". $119.00 plus applicable taxes and shipping.